Avast, matey! Get ready for a pirate adventure on the seven seas! NetEnt’s brand spanking new video slot, Hook’s Heroes is sure to give all ye scallywags plenty of plunder! Our carouser crew has already scouted Captain Hook’s vessel and you can read all about it here. -Play 50 rounds on Fisticuffs - get 5 free spins on Hook’s Heroes per day. Play 50 rounds every day the next 7 days and get 15 bonus free spins. 35+15 = 50 free spins! -Play 100 rounds on Fisticuffs (min. 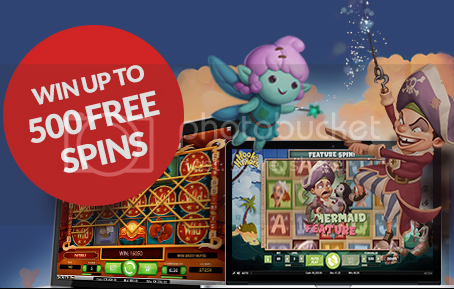 bet amount £€0.40) - get 10 free spins on Hook’s Heroes per day. Play 100 rounds every day the next 7 days and get 30 bonus free spins. 70+30 = 100 free spins! Play 500 rounds on Fisticuffs (min. bet amount £€0.40) - get 50 free spins on Hook’s Heroes per day. Play 500 rounds every day the next 7 days and get 150 bonus free spins. 350+150 = 500 free spins! All hands on deck, ye landlubbers! Hook’s Heroes and all the booty within awaits!